In large bowl, combine 1 1/2 cup flour, sugar, baking powder, undissolved yeast, and salt. Heat buttermilk, sour cream, water, and butter until very warm (120 to 130 F). Gradually add to flour mixture. Beat 2 minutes at medium speed of electric mixer, scraping bowl occasionally. Add eggs and 1 cup flour. Beat 2 minutes at high speed, scraping bowl occasionally. Stir in enough remaining flour to make a soft dough. Divide dough into 3 equal portions. Roll each to 15 x 6-inch rectangle. Transfer to greased baking sheets. Sprinkle chopped maraschino cherries lengthwise over center-third of each rectangle. With a sharp knife or pastry wheel, make cuts from filling to dough edges at 1/2-inch intervals along sides of filling. Alternating sides, fold strips at an angle across filling. Shape into candy canes. Cover; let rise in warm, draft-free place until doubled in size, about 45 minutes. Bake at 375 F for 15 to 20 minutes or until done. Remove from sheets; cool on wire racks. 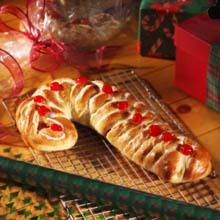 Drizzle with Powdered Sugar Glaze and decorate with halved maraschino cherries, if desired. Powdered Sugar Glaze: In small bowl, combine 1 1/2 cups powdered sugar, sifted; 2 to 3 tablespoons milk, and 1/4 teaspoon vanilla extract. Stir until smooth.